If you have a website issue not listed on this page, please call customer service at 800-338-6157 or email us and we will assist you. How do I obtain a user name and password for the website? If you are a current customer and would like to obtain a login and password for online ordering, please contact your Customer Service Representative. If you do not yet have an account with us and would like to begin ordering, please submit a customer application. This application is a fill-in form that can be completed online. 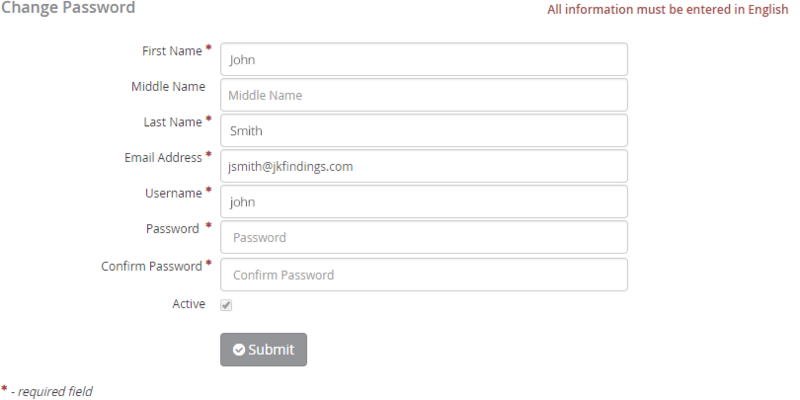 Simply key information directly onto the form and click 'submit'. I would like to set up an account with open payment terms. How do I do this? To apply for an account with open payment terms, complete and submit our online customer application. This form may also be accessed by clicking 'Create Account' at the top of the website. What kind of payments do you accept? We accept Visa and MasterCard. If you have been pre-approved for Net 30 terms, you may place an order On Account. Do you have a minimum order policy? Yes, we do have a minimum order policy of $250. If you submit an order for less than this amount, we will contact you to either add more items or cancel your order. Why does my order summary indicate that shipping charges will be calculated at a later date? Accurate shipping charges cannot be calculated until your order has been pulled and an accurate weight is determined for your shipment. An estimate can certainly be provided at time of order. Just contact our Customer Service Department with your web order number and they would be happy to advise you of the estimated shipping charges. I would like a printed copy of your catalog. How do I get one? The link to our Catalogs and Flyers page is located in our top navigation pane. You may also access them here. Click this link and then click the cover of the catalog you wish to print. An interactive version will load. To print, click the printer icon in the menu at the bottom of your screen. What if I realize that I made a mistake on my order after submitting? As long as the status of your order does NOT show as Processing or Completed on the Order History page, we can correct your order for you. Email or call our Customer Service Department for assistance. Please have your web order number ready. I see items on your website that I am interested in but the prices are not listed. How do I get information on your pricing? Pricing is available on our website but you must log in to see it. Existing customers can contact us for a user name and password. New customers should complete and submit our online Customer Application. This form may also be accessed by clicking 'Create Account' at the top of the website. Do your product pictures depict actual size? No, the product pictures are not actual size. For information on size and weight specifications, click on an item and review the description and specifications tabs or contact our Customer Service Department. How soon will I receive my order? If the items are in stock, we will ship it to you the same day. If not in stock, turnaround time will vary. Your Customer Service Representative can provide you with an estimate. I have ordered an item whose inventory status is showing as Back Ordered. When will I receive my order? Once your order is received and accepted, one of our Customer Service Representatives will contact you with an expected ship date. If this date is acceptable to you, we will process your order. If the date is unacceptable, you may cancel your order. How much will domestic shipping cost? Shipping charges depend on order quantity and weight. Your Customer Service Representative can provide you with an estimate at the time of your order. Do you have a physical selling point or showroom? No, you may browse our product online or request to meet with us during one of our sales trips or at one of the trade shows we exhibit at or attend. Do new customers need to provide a VAT number? No, we are not located in a country that collects and pays in VAT. 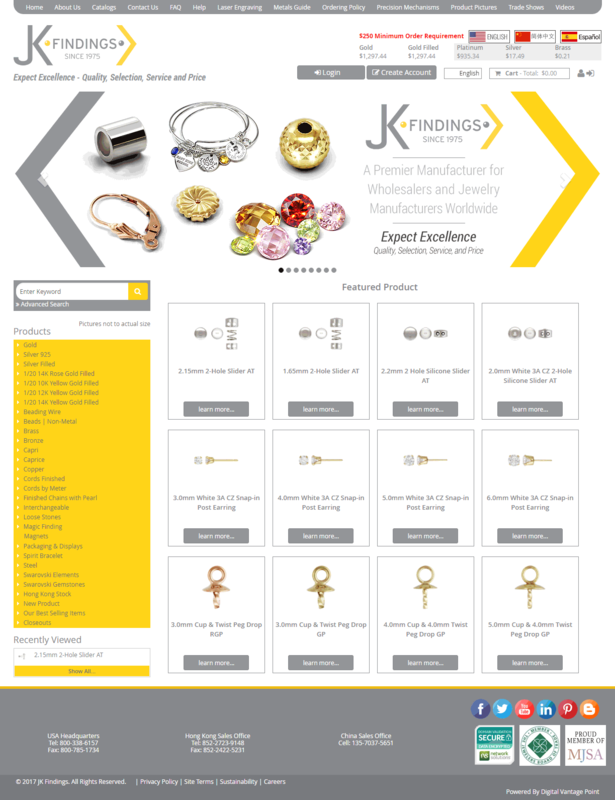 JK Finding's new website will make your browsing and searching experience more pleasant and efficient. Many things have changed, so we are here to guide you in the process of becoming familiar with our new features. The following section is an overview and description of the ins and outs of using our site. We hope you enjoy our new home; any feedback is greatly appreciated! 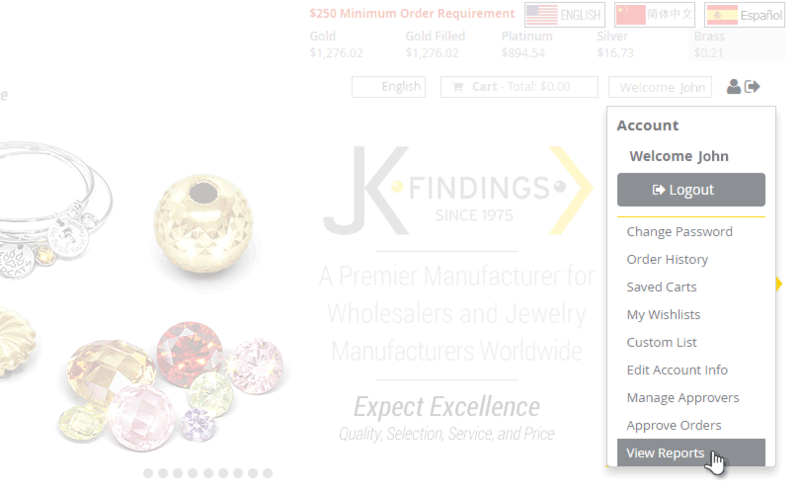 When first arriving to JKFindings.com you will be presented with our main page that links to all functional areas of our website. Our top left sidebar is dedicated to product navigation. 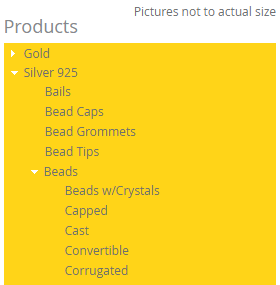 You see the main product navigation headings, which include: Gold, Silver, Silver Filled, Gold Filled, etcetera. You can click on each main heading to expand the list to see further sub-headings containing their associated products. Any category with a white arrow beside it can be expanded. Our product navigation is structured like our catalog; each heading has a sub-heading which eventually leads to a specific product. If you want to save time and bypass this navigation, you can type a keyword (name, number, etc.) into the search box in order to bring you right to your desired item. Aside from searching, you have the choices of either solely using the sidebar to find your product, or clicking on the associated pictures that appear in the body of the website after you select a main heading. Either option will lead you in the same direction; it is up to you whether you would like to search for your product textually or visually. You are also able to do an 'advanced search' by clicking on this text next to the search box. If you select this option you will be able to search by item number, product name, description, or category. With advanced searching, you are able to combine two or more search filters. Regardless of the method you choose, when you arrive at and click on the product you are looking for, you will be brought to the product page listing variants of that specific product (metal type, size, style, etc.). Our product page gives you all the information you need to know regarding your selected item. First, it will allow you to get a larger view of the product in order to inspect all of its details. Simply click on 'view larger image,' to get a close-up look. 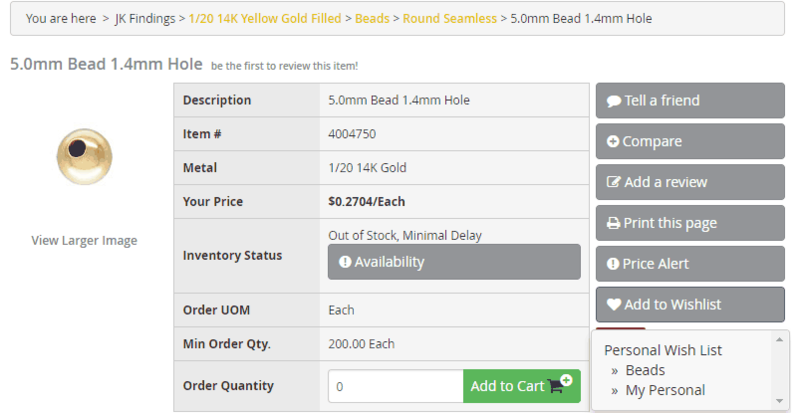 Next to each product image you will see a description of the item, the item number and the inventory status. Below the product image we have tabs to access a description, specifications, related files, reviews, accessories, and user review. If you are logged in to the site, additional options will appear on the product information pages: availability, tell a friend, compare, add a review, print this page, price alert, and add to favorites. To create an account please contact us via email or telephone. Once you have an account you can login by clicking the 'login' button at the top of the page. After logging in you will be brought back to the main page. One thing you should notice when you login is the shopping cart items in the top right corner. Clicking this box will display buttons that will allow you to review your shopping cart. Once you begin to add items to your cart a shopping cart summary box will also appear in the bottom left column of the webpage. The items in the shopping cart box include a display of your cart total and a link to go to the check out page. This box will show you the items in your cart, the total price of these items, and a link to the check out page. The cart display on the homepage will update each time a new item is added into the cart. When you have logged in, and you have navigated to your desired item, you will be able to add it to your cart by clicking the green 'add to cart' button that will appear next to your product. Before you add an item to your cart, be sure to input the order quantity you desire. Be mindful of the minimum order quantities; if you do not input the minimum requirements you will receive an error message. When you are ready to checkout you must go to your shopping cart. Here you will see the name, price, availability, order quantity, and cost of each item you have chosen to purchase. 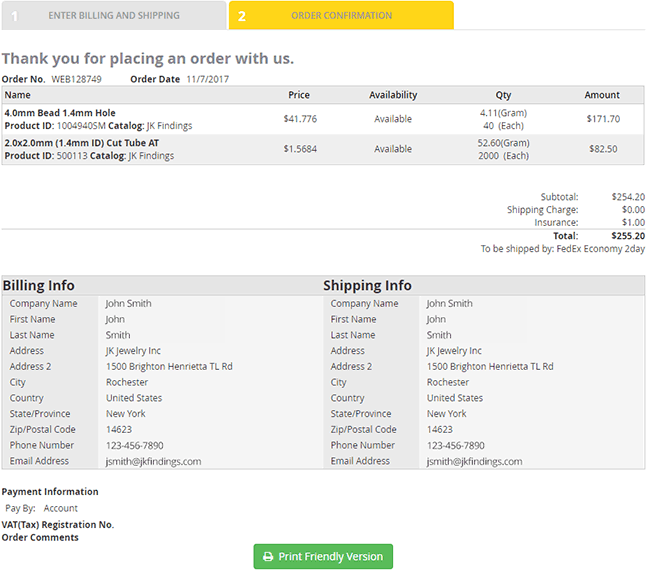 In the shopping cart you have the options to either save your cart for future use, print your cart, update your cart (change order quantity/delete item), or checkout. When everything looks the way you want it to, click on the green check out button to begin the submission of your order. After clicking 'Check Out,' you will be brought to our one-step checkout page that provides an order summary and asks for your billing and shipping information. If you have a coupon to apply to your order, please enter it in the 'Promotional Coupon Code' field and click 'submit'. When you create your account you provide us with your billing information and that will automatically show up on the page. The billing address is not editable; you will have to contact us to change it. You will; however, be asked each time to provide your shipping address. If you would like your shipping address to be used in the future, check the 'save for future' checkbox below the shipping address block. This will automatically store this information in our database for future use. To select a previously saved shipping address, click the 'ship to' dropdown menu located at the top of the shipping address block, and select your desired address. One of the options in this drop down menu will be "use billing address." 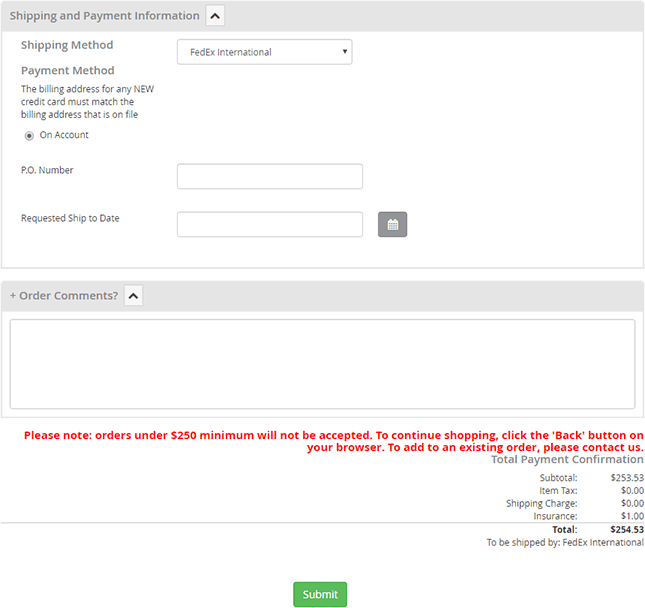 Select this option if you would like to copy the information from your billing address as your shipping address. The next section will ask you for your preferred shipping and payment methods. 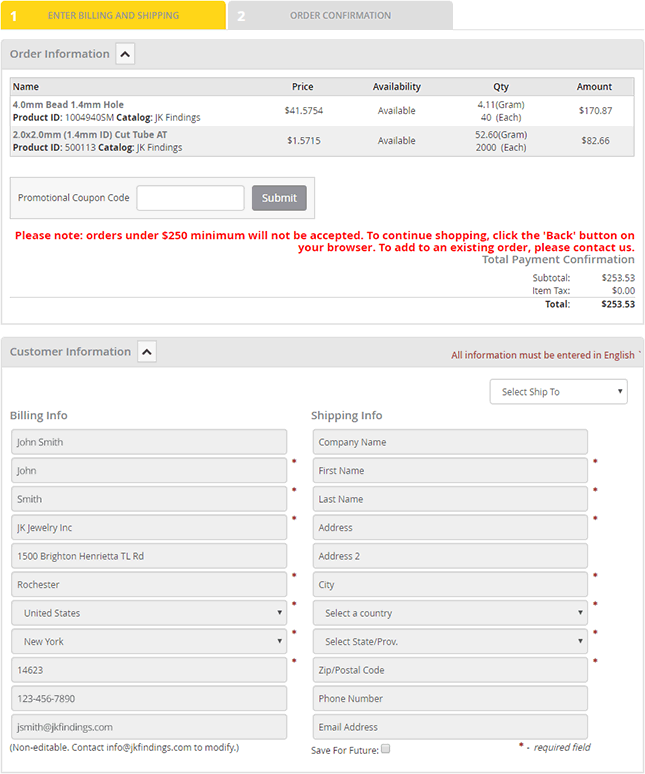 The available shipping methods are located in the first dropdown box. The entire page will refresh to reflect your selected shipping method, although shipping costs will be calculated at a later date. Your payment method reflects your credit terms with us. To change your payment method, please contact our credit department. A PO number, requested ship to date and order comments are optional. Click 'submit' to process your order. A confirmation page will be displayed and an email will be sent to you confirming receipt of your order. Our new website is constructed in such a way that it grants different levels of permission to different users from the same customer card (your company). Some parts of our website will be restricted to certain users as outlined in the following section on account options. Click the gray "person" icon in the top right corner of the website under the metal markets to logout or view your account options. Note: Menus may differ depending on your permissions. This page contains the main details of your account, and is the location at which you can edit them. This page displays your name, email address, username, and allows you to modify your password. There is also a check box that if checked, identifies that the account is active. For security reasons, it is recommended that new customers go to this page first to change their assigned password to something more personal. Selecting Order History will bring up the Order Summary Page which will show your 25 most recent orders. Submitted: The order has been submitted from the website. Pending Approval: The order has been submitted from the website, but is pending approval. Approved: The order has been submitted from the website and is accepted. Denied: The order was submitted from the website, but denied or cancelled. Denied and Resubmitted: If an order has been denied approval, it can be resubmitted for an approval from the website. Processing: The web order has been converted to a sales order. Completed: The order is complete when it has been fully shipped and invoiced. You can change your viewing option by selecting the drop down menu that appears at the top of the page. You can select a previous month or choose to see all of your orders. You are able to click on a past order to see the specific details of that order. On the details page you are presented with a listing of the items you previously ordered, and you are able to select any or all of the items to add them to your current cart. This is very beneficial if you are going to place an order similar to a past order or you wish to ensure reordering of the correct item number. To save your cart, simply select the drop down menu below your cart. Choose to overwrite an existing cart or save a new cart. To save a new cart, select 'Create a new saved cart >>' and enter your new cart name, then click the green 'save cart' button. Once you save your cart it will show up on the main saved carts page. Your wishlist page will show the wishlist groups you have created from a personal, company, or sales perspective. Toggle between personal, company, or sales wishlists, if applicable, in the upper right hand of the wishlist page. Any user can delete a personal wishlist; permission must be granted in order to delete a company or sales wishlist. 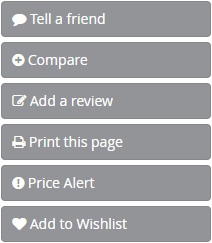 Once you have created a group (wishlist) you are now able to add items to it when on an item product page. On the item page description box there will be a button called 'Add to favorites' that will allow you to save the current item in a specified group that you have created. Once you have added an item to your wishlist, a notification will pop up under the item photo. Click the notification to go to a page where you can 'add checked items' to the cart, or 'delete checked items' from the group. Selecting customer info will allow you to manage the details of the customer card you belong to if you have "modify existing customer" permission. You are able to edit all customer details, and can also check the credit limit balance, add a new shipping address, or add a new contact account for your company. On the manage approvers page, if you have the necessary permission, you are able to create a new approver. You must provide the approvers: web contact, max amount, max line amount, max unit price, name, and whether or not they can approve non-contract items. After filling in this information, check the 'in effect' checkbox to confirm and click the yellow submit button. When selecting approve orders, if you have the necessary permission, you will be able to see the orders that need to be approved. You can then select the orders that need approval, and respectively begin the approval process. Depending on the permission granted, you are able to view two reports. If you have "view and execute the accounts receivable report" permission you will be able to view your accounts payable report. You can select your desired report by choosing an aging method: transaction date, due date, or document date. If you have "view and execute the sales order status report" permission, you will be able to view the order status report. Click on the respective boxes to open and generate the reports. You may then click on the 'printer friendly version' button to print a copy of what you desire. To add or modify an existing ship-to-address, select Manage Ship-To-Address under Account Options. Simply click on the "add an address" or "edit" button and make your change.